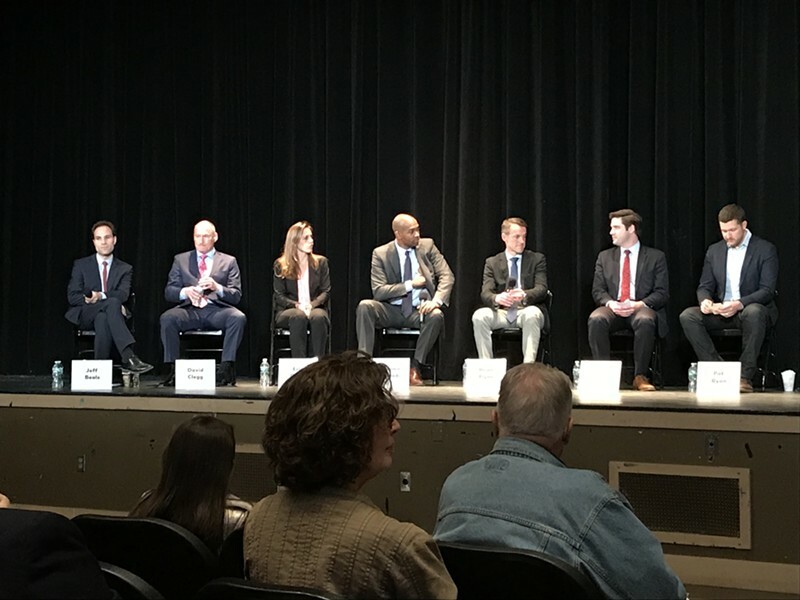 Candidates from left to right—Jeff Beals, David Clegg, Erin Collier, Antonio Delgado, Brian Flynn, Gareth Rhodes, Pat Ryan—at a forum in Kingston on April 26. 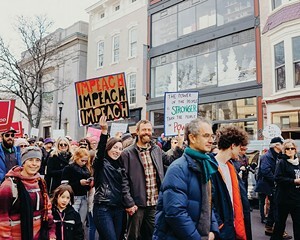 The post-2016 age, or “Trump era,” has served as an inflection point for a beleaguered and disheartened Democratic party looking to reconnect with grassroots and blue-collar voters. In some ways it has been a period of unprecedented unity. 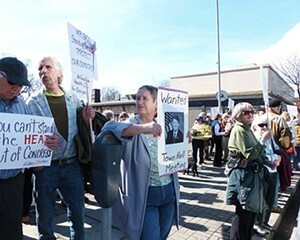 In Congress, Nancy Pelosi and Chuck Schumer, the Democratic leaders of the House and Senate respectively, have been able to keep their caucuses firmly in line when voting on key pieces of Trump and GOP legislation. But 2018 Democratic primary elections have not been so docile, with many moderate and liberal incumbents facing fierce challenges from progressive insurgents. From California to Illinois to West Virginia, and right here in New York with our gubernatorial race, the “blue wave”—the surge of Democratic enthusiasm that has led to massive leftward swings in house special elections in 2017—threatens to topple as many Democratic incumbents as Republicans. New York’s 19th District election, one with no Democratic incumbent, is a different story altogether. 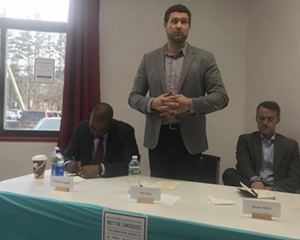 It’s a race to the left here in the Democratic primary for New York’s 19th Congressional District. the Hudson Valley. 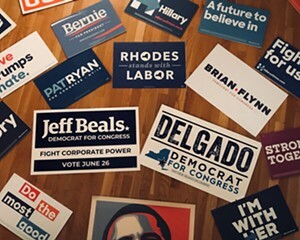 There are seven candidates facing off to challenge incumbent Republican John Faso in November—Jeff Beals, David Clegg, Erin Collier, Antonio Delgado, Brian Flynn, Gareth Rhodes, and Pat Ryan. The candidates broadcast a unified message of change and new leadership. Stark differences are not ideological, for the most part, but rather in their characters, personalities, and demeanors. With the New York primary rapidly approaching on June 26, it's time to figure out who's who before casting those ballots. Here is a rundown of the candidates. 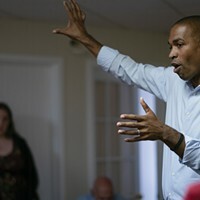 Antonio Delgado, a lawyer from Rhinebeck who towers over his opponents, both in physical stature and in gravitas, combines modern progressive flavor with a similar swagger, rags-to-riches biography and Ivy League pedigree to that of Barack Obama. Like Obama, Delgado presents himself to voters as a savvy, hard working, and intellectual lawyer from humble beginnings who will be able to take their progressive hopes to Washington and get them enacted. Furthermore, Delgado’s family is central to his campaign, with his cohesive unit being looked upon admirably by the electorate, just as Obama’s was. But Delgado’s similarities to Obama may be as much his greatest weakness as his greatest strength. Delgado presents himself almost as the presumptive nominee, based on the fact that he has raised by far the most money—he's raised nearly $2 million dollars as of the end of March—and he's put forth a message that he is the most viable candidate to take on John Faso. In a year with an anti-incumbency sentiment within the Democratic party, being something of the de-facto incumbent might not be the best position. That said, Delgado is comfortable in front of a room of people and has both the political and policy chops to supplement his compelling personal character. 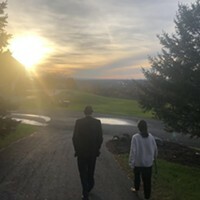 In the Kingston High School forum on April 26, he answered a question about racism and white supremacy deftly, skillfully combining his work with underprivileged youth with an overarching message on criminal justice reform, highlighting wealth challenges in minority communities as the root cause of racial inequality. This nuanced yet concise answer, and the many others like it, demonstrated why Delgado may be the man to beat.